Playbook is based around Inside and Outside Zone, simple terminology. Simple IZ & OZ blocking scheme which the entire playbook is based around. SIMPLE play calling system- “Apple” for Inside Zone, “Orange” for Outside Zone. Trio Formation allows you to get into several other formations with only having to move the H.
Multiple Inside and Outside Zone Tags (adjustments). Easy to install playbook that will give your offense direction and an identity. This playbook is based around the Inside & Outside Zone play. All the complements and tags work off of the Inside and Outside Zone. Having only two base blocking schemes will limit what you have to teach. This will allow your players to understand the blocking scheme and it will allow them to play faster and be really good at what they do. The Inside and Outside Zone Blocking Scheme is easy to teach, it’s highly versatile, and it can create easy double teams on the line of scrimmage. Essentially the line is just looking at their play-side gap. If there is a defender in their play-side gap they will block him. Limiting the amount of block concepts is very important in youth football. Many coaches will fall into the trap of having several different blocking schemes. In this playbook your team will master two simple schemes. This playbook utilizes the Trio Formation which is very simple and will allow you to be multiple by only having to move one player. The Inside and Outside Zone can be ran out of any formation/ personnel grouping. You can line up in several different formations while still keeping the same blocking scheme. This will allow you to be multiple while only having to teach one or two blocking schemes. Regardless of the formations you use, the blocking rules will always stay the same for your offensive line. It keeps things simple and allows your team to become very good at what they do. This offense is very simple and is also very structured. This offense features a system of plays and tags that can be utilized to take advantage of the defense. This playbook doesn’t have a ton of plays, but it does have several different tags that you can implement that will allow you to adjust to what the defense is doing. It comes down to running the same plays several different ways. The simple terminology, the formation variations, and the adjustment tags gives your offense answers and it gives your offense structure. 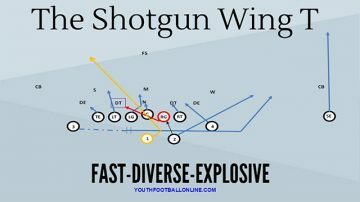 Formation overview, positions, play calling system, blocking schemes, base plays, and tags/adjustments. Plays included: Apple (Inside Zone), Apple Q, Jet Apple, Apple Juice. Orange (Outside Zone), H Orange, Q Orange, Jet Orange, Orange Juice.